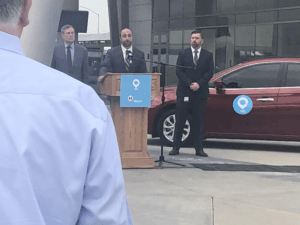 The Los Angeles County Metropolitan Transportation Authority (LA Metro) has partnered with rideshare/microtransit provider, Via, to offer affordable rides to or from three local transit stops: Compton (Artesia), El Monte, and North Hollywood. This agreement replaces the original “Two Region Mobility on Demand Partnership, Seattle, Washington and Los Angeles County, 2017” linked to, below. During this one-year pilot program, rides to or from the designated stops can be requested through the Via app or by phone. Although Via operates a microtransit fleet, it will use sedans and SUVs to fulfill rides. Accessible vehicles are also available upon request. Rides cost $1.75 (the price of standard Metro fare) for users who pay with a TAP transit card, and $3.75 for those who do not. Low income passengers enrolled in LA Metro’s discount program can ride for free. This partnership, funded in part by the Federal Transit Administration, aims to offer locals a convenient, equitable way to connect with LA transit.